What's the Minimum Military Enlistment Time? What Is the Minimum Military Enlistment Obligation? Serving in the military is a commitment for both the person "reporting for duty" and also for the military. There is a contract a military enlistee will sign to serve a certain number of years, but the military also guarantees you a paycheck, living quarters, food, clothing, medical and dental care, and training. What is the time commitment you need to be a member of the United States Armed Forces? There is a short answer as well as a longer explanation of all the options below. Two years is the shortest amount of time a new enlistee can sign up for active duty, however, there is a catch. You actually have an eight-year commitment but you can perform this commitment as an active duty member, a Reservist, or Individual Ready Reservist (IRR). The National Call to Service - All of the services also participate in the Congressional - mandated National Call to Service Program. Under this program, following basic training and an advanced training school, a member spends 15 months on active duty (full time), followed by a minimum of 2 years in the active (drilling) Guard or Reserves, with the remainder of the total eight-year commitment in the IRR. However, all the services (except the Army) strictly limit the number of folks who can enlist under this program each year. 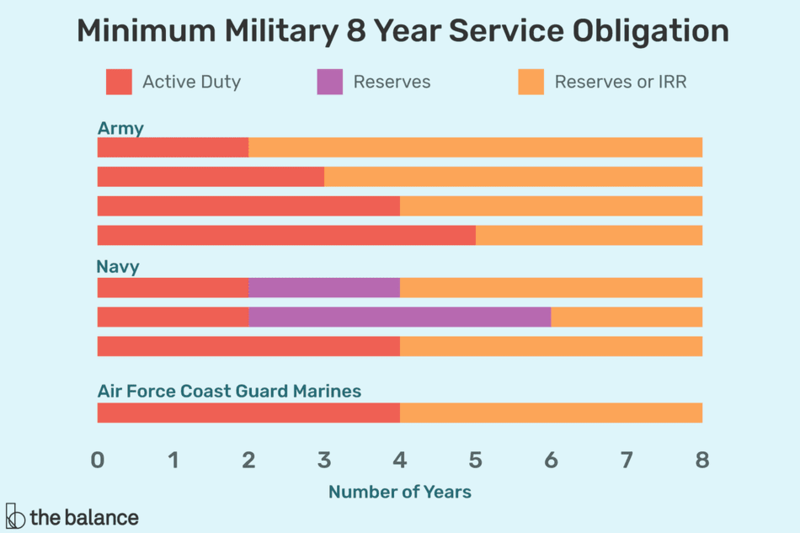 Everyone who enlists in the United States Military, whether it's for active duty (full time) or National Guard/Reserves (part-time) incurs a minimum eight-year service obligation. That's right — when you sign on the dotted line, you commit yourself for eight years. But the ways to serve can be in active duty, reserves, or Individual Ready Reserves. Whatever amount of time is not spent on full-time active duty, or spent in the Drilling National Guard/ Army, Air Force, Navy, or Marine Corps Reserves is spent in the IRR in order to complete your time of the military contract. However, most of these contracts are four to six years of active duty followed by the remaining years in the Reserves or IRR. The Reserves or National Guard duty is a part-time soldier but a way to complete your commitment with the military by going to drill one weekend per month, and two weeks per year. You are subject to be called to active duty should the need arise. In the IRR, individuals are not required to drill, nor do they draw any pay, but their names remain on a list and they can be recalled to active duty at any time until their total eight-year service obligation is complete. In fact, for the war in Iraq and Afghanistan, the Army has already recalled over 5,000 soldiers in the IRR back to active duty (so far, the Army is the only service who has recalled IRR). For example, let's say you enlist in the Army on a two-year active duty contract. At the end of the two years, you separate from active duty. For the next six years, you are subject to recall to active duty at any time, if the Army feels they need you to help supplement active duty or reserve deployments. Keeping the above in mind, the Army offers active duty (full-time) enlistment periods from two years to five years (only certain jobs are available for two and three-year enlistees). The Navy will offer a two-year active duty enlistment, but they couple it with a two or four-year active (drilling) Navy Reserve commitment. The minimum active duty enlistment periods offered by the Air Force, Coast Guard, and Marine Corps is four years. There are other training options you can do as a former Army active duty member while in the National Guard to advance your career. There is an Army Special Forces program (Green Beret) that allows for a National Guard member to attend the various schools in the Special Forces pipeline and actually become an Army Special Forces soldier earning the Green Beret. Once you are a member of the 19th and 20th Special Forces Groups you will continue to train and can deploy when needed as an augmentee into an active unit. Active (drilling) Reserve and National Guard enlistments are usually for a minimum of six years (if one wants the education benefits). If you are commissioned as an officer through the ROTC or Service Academy college programs, you owe the military five years of active duty service with a two-year option of Reserve Duty or IRR. What Is the National Call to Service? Can You Transfer from the Reserves to Active Duty?